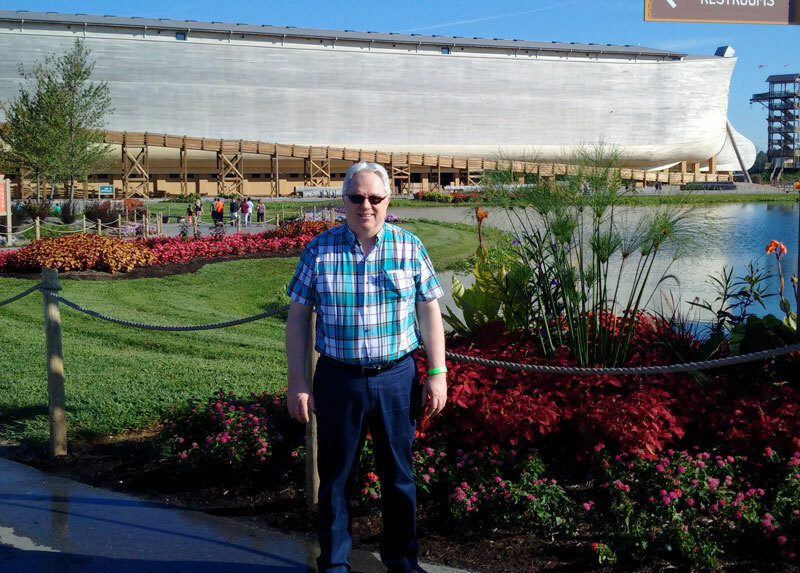 On August 9, 2017 I visited the new Theme Park/Exhibit called The Ark Encounter in the Cincinnati area, in Kentucky. The Answers In Genesis (AIG) ministry has built a full size replica of Noah’s Ark for people to visit. 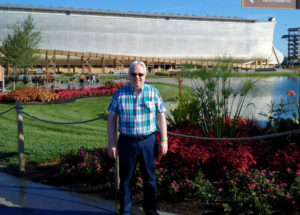 Caption: I stand perhaps 150 yards from the AIG Ark Encounter near Williamstown, Kentucky. I believe Adam, Eve, Methuselah, Noah, and others mentioned in Genesis 1-11 were real people and that the global Flood was a real event in the time of Noah. The Ark Encounter from Answers In Genesis is a great place to visit. Everything is well done and there are activities to do outside the Ark itself, such as a zip line ride and a small zoo. There are a number of small shops to get crafts and snacks. There is also a very nice restaurant that has a marvelous buffet that is able to handle a large crowd. On the Ark itself is 3 levels of exhibits. It took my friend and I perhaps something over 5 hours to see everything. You realize how big the Ark is as you walk to see it all. It really is a lot of walking. The Ark Encounter is built almost totally of wood. It is said to be the largest timber-framed wooden structure of its kind in the world. It uses 1.5 million board feet of heavy timber. Some of the building methods followed those used by Amish builders, who are experts in building wood structures. The back side of the Ark is connected to a building made with modern typical construction methods which includes the elevators and restroom areas. The Ark is also set 15 feet above ground on special concrete piers. Inside, there are areas that demonstrate how various kinds of animals could be housed and managed inside the Ark as well as how Noah’s family would live. There are two theater areas inside the Ark. Though the structure is wood, the displays and exhibits are very high-tech. Some exhibits were created using 3D printing technology. I would say the exhibits essentially answer all the common questions people have about Noah’s Flood and Noah’s Ark. 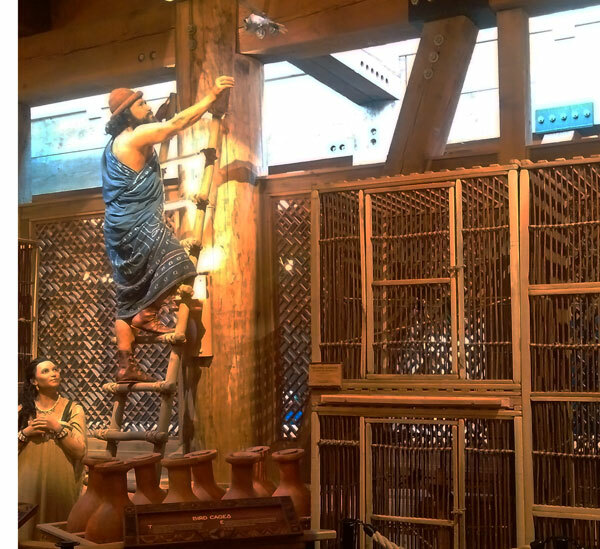 As we were arriving to the Ark Encounter, it occurred to me that what Christians were doing today in visiting the Ark today in Kentucky is much like when Noah was building the original. Noah spent years building the structure and had to solve many challenging problems to do it. He must have done it outside of cities of the time, in order to have space and wood to do it. People probably came out to see it, even if just to laugh at Noah. This is like today, when people visit the Ark. Some come with family though they don’t believe it, and so they see the faith of others and they wrestle with what faith in the God of the Bible means. The gospel is presented at the Ark Encounter in multiple ways, so it really is a good place to bring non-christian friends or family. 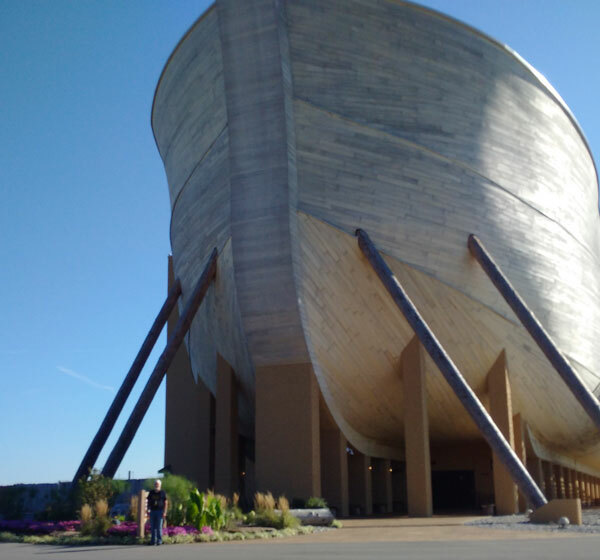 So people go outside of Cincinnati today to see the Ark (south of Cincinnati near Williamstown, KY). The people of Kentucky and Cincinnati know the Ark is there and so it is a witness that points to the faith of Christians who believe the Bible is literally true. There are still people who believe the book of Genesis tells us real history, even today in 2017. This faith is not outdated or misplaced, nor is it wishful thinking. The Ark Encounter exhibits demonstrate reasonable answers to the questions people have, in order to remove obstacles to people believing in Christ. So, Christians demonstrate their faith today in going to see the Ark. We don’t actually know how Noah and his family solved all the problems of living on the real Noah’s Ark, but this is not a problem. If we can come up with reasonable answers to the questions today, then Noah could have found reasonable answers to the problems then. Caption: Front end of the Ark. Friend Mark stands near it. The Ark Encounter affirmed many things that I have taught about Noah’s Flood and Noah’s Ark over the years. But I also learned a number of things in my Ark encounter. I learned about extinct animals I had never heard of because the exhibits showed replicas of a number of extinct animals, that would have been on the real Ark. I learned about methods of removal of waste from the Ark and ventilation of the Ark that would be feasible for Noah’s family to use on-board the Ark. I learned that the number of animals needing to be on-board the Ark could have been less than I had expected (about 6,700 by AIG research). In a number of ways, Noah’s family had to find ways to “work smarter, not harder” to manage caring for the animals. The Ark Encounter helps visitors find answers to their questions on the Flood. The Ark Encounter also helps people imagine the corruption of the preflood human society, where people lived at the same time as dinosaurs. Geological evidence for the Flood, the cause of a post-flood ice age, and other scientific questions were addressed also. Reasonable well-informed answers are provided. Granted some of the exhibits are based on speculative reconstructions, but demonstrating that this can be done today implies it is plausible Noah and his family could have done it in the past. The Answers In Genesis Ark structure is not the first replica of Noah’s Ark that has been built, but it is probably the most authentic. In 2012 CNN did a story about a man in Dordrecht, Netherlands who built a replica of Noah’s Ark. It has been called Johan’s ark, after Johan Huibers, the man who built it. Johan is a wealthy businessman. He built it to be a “Bible museum.” Huibers did not have the means to built an ark in an authentic way. He put barges together and then put wood around it. Huibers did make it the Biblical dimensions but he seems to have used a smaller value for the length of a cubit than Answers in Genesis, if the CNN article is correct. In Bremerton, Washington there is a Noahs Ark Restaurant, but it is not built as a replica of Noah’s Ark, it is more of a theme of the restaurant. There have also been a number of churches built to be similar to Noah’s Ark. Churches have always considered it as a salvation message, that Jesus is like “our Ark” and the one way to be saved. There has also been ship engineers and naval architects who have studied Noah’s Ark. Some have made small scale engineering models and studied them in wave tanks. The late Henry M. Morris showed that the dimensions of the Ark made it almost impossible to capsize in the water. The engineering studies have consistently shown the unique proportions of the Ark from scripture make it quite stable in the water. Another study by a mechanical engineer (from the 2013 International Conference on Creationism) looked into whether immersion in water for extended periods of time would weaken the structural strength of the Ark. The conclusion was that any weakening effect was not great enough to threaten the structural integrity of the Ark. In our modern world, where Bible stories are often thought of as like myths or legends, the Ark Encounter shows that we can believe the Bible is really true. Much attention to detail in the exhibits demonstrate how a family like Noah’s long ago might have managed all the challenges and lived through the experience. The sight of the AIG Ark structure is very impressive. It will undoubtedly spark much conversation about the Bible and the book of Genesis. The key issue brought up by the Ark Encounter is probably the authority and historicity of Genesis in the Bible. The Ark Encounter is a quality attraction that I highly recommend. Caption: Noah reaches to catch the dove to return him to his cage. Website from Tim Lovett and others on the engineering of the Ark. Why does the universe exist? Why is it as it is? Why should it be so vast and awe-inspiring? This question crosses people’s minds and people make significant choices when they deal with the question. One option is to just not deal with the question. Someone might think for example that it is an unanswerable question. Others might follow modern scientific ideas and say there is no “why” to the universe’s existence, that the universe just spontaneously happened. But this is not a satisfying answer. Recall the book called Contact, written by the late Dr. Carl Sagan (published 1985). The book Contact was made into a movie. In Contact, a radio signal is received from space that is found to have a message in it from intelligent beings. So people on Earth find that the message is actually elaborate instructions for building a machine which will transport someone across the universe. So an astronomer, a woman named Dr. Arroway, makes the trip in the device and has an encounter with an alien being. There is an intriguing statement about the question of life in the universe repeated multiple times in the Contact movie. It begins when Eleanor Arroway is just an inquisitive girl who asks her father if there were people on other planets. After first saying he didn’t know, her father responds with the statement, “If it is just us, it seems like an awful waste of space.” Dr. Arroway later repeats this statement to school children. Dr. Arroway in the story comes from the atheistic mindset, she does not believe in God but she accepts the concepts from modern science that the universe is billions of years old and it came from the Big Bang. The “wasted space” comment is I think implying a certain naturalistic (atheistic) argument that goes something like this. First, the universe formed not from the creative activity of an intelligent Creator but by natural processes over billions of years. Out of deep time and many combinations of processes forming stars and planets, life formed by natural processes in rare instances on certain planets in the universe. Given the many billions of years and the vast number of combinations of scenarios in how planets form, there is bound to be life forming on other planets the same way it formed on our own planet. I think this is Arroway’s thinking in the story. So I think the concept of “wasted space” from Dr. Arroway is actually a misnomer. If there is no “why” to the existence of the universe, then on what basis could you say that the vastness of space is wasted? She is saying that since we exist, other intelligent life must exist also, somewhere. This is not a “scientific” conclusion, it is more of a hope from a certain world view. Dr. Arroway thinks that it would be a “waste” if we were the only intelligent life, considering the vastness of the universe. There is a statement in the Contact book to the effect of, how could there be billions of worlds going to waste, as barren lifeless worlds? But the naturalistic mindset views the universe as a product of a kind of numbers game. It is because of the vast numbers of planets and stars out there and the long periods of time that we were lucky enough to exist. Out of many stars and planets the “waste” is that most of them don’t support life, but it is often believed that a few of them would and we are ‘lucky’ enough to be on one of those planets that support life. On the other hand, Biblically, it is not a numbers game at all! Isaiah 45:18 (NIV) makes clear that Earth exists by deliberate design for life, especially for us. The scientific evidence for many extrasolar planets, discovered some years after the publication of Sagan’s Contact book, would be seen as supporting this view by many. But if Dr. Arroway were a real astronomer today, would the discoveries about extrasolar planets support the same “wasted space” concept? There are certainly many extrasolar planets. The scientific evidence for this is good. In our galaxy the Milky Way, it is not unreasonable to say there is likely to be as many extrasolar planets as there are stars in the galaxy. The number of stars in the Milky Way is now estimated at about 200 billion. Some stars have no planets but some have multiple planets. Astronomers debate the habitability of some of the extrasolar planets. Some are of the right distance from their stars to have a temperature range that could allow for liquid water. But this in itself doesn’t tell us if the exoplanet even has water. Even if there is a life-friendly atmosphere and liquid water on an exoplanet, there are effects from the star that could make life impossible. Many stars are not so stable as our own star and solar flares could destroy life on many of the known exoplanets. The scientific question of how life would arise on our own planet without a Creator is not really a resolved issue either, so we do not really know enough to confidently assert that life could arise on an exoplanet, just because it exists on Earth. So the question of life on extrasolar planets is really a question science cannot answer. There is reason for skepticism and yet there are planets that could be in the habitable zone for other stars. But in real scientific research, no one has found evidence of an intelligently coded message from space as in the Contact fictional story. Still many hope for something like the Contact story to happen one day. The Biblical view suggests a very different way of understanding the universe. In the Bible, the important issue is not are there intelligent alien beings similar to us, but is there an intelligent Creator worth knowing and worshiping? What if the universe is first and foremost a means of communication from an infinite Creator-God? It is not vast for the purpose of supporting many different intelligent life forms, but it is vast primarily for helping finite mankind to imagine an infinite Creator. Since an all-powerful being could do anything easily, it would not be too much for an infinite Creator to make a vast universe to stimulate our thinking. The Bible presents God as unlimited in power and all-knowing. He is spirit, yet can exist in human form, as in the person of Jesus Christ. Solomon stated “the highest heavens cannot contain you…” when he was dedicating the temple long ago in ancient Israel (1 Kings 8:27, NIV). King David once wrote in Psalm 139, “If I go up to the heavens, you are there…” (Psalm 139:7-8). Psalm 19:1-4 makes the well-known statement “The heavens declare the glory of God, the skies proclaim the work of his hands….” What is this “glory” that the heavens declare? I think it is about God’s greatness and his nature as One who wants a relationship with us. The glory in the universe should motivate us to want to know its maker, and our Maker. The Bible does not really even entertain the notion that natural processes could be adequate to create the universe. Only an all-powerful Creator could be an adequate first cause, in the Christian world view. But the Bible, as the special revelation of the Creator-God, uses nature and sometimes references to the universe to help human beings grasp how God is so much different and greater than us. Consider the passage below from Isaiah 55:6-9 (NIV). It has always seemed an amazing thing to me that the infinite Creator would have any interest in our lives. Yet, Scripture actually goes so far as to “measure” God’s love by the vastness of the universe! Psalm 103:11 puts it in the strongest terms, “For as high as the heavens are above the earth, so great is his love for those who fear him.” I once wrote an article about a Gamma Ray Burster object (GRB 090423, CLICK TO GO TO). By the usual way scientists interpret redshifts to indicate distance (Hubble’s Law), this object would be over 13 billion light-years away from us! It was a very brief powerful burst of energy and scientists are not sure how so much energy could be generated. This has been described as one of the most distant known objects in the universe. Biblically, the universe is not big and impersonal, but big and personal. It is something from an infinite Being who wanted to give finite human beings with limited imaginations something tangible to help us imagine what He is. If you try you can find another way to look at the universe, but I would say the other ideas are neither logical nor satisfying. I’ve wrestled with how secular science tends to view the universe differently than the Bible. The naturalistic origins theories from secular science are not so well established as most people think they are, including Big Bang theory. Science has not ruled out supernatural creation by a Creator, it simply cannot model it. We cannot argue that supernatural creation did not happen just because science cannot model it or quantify it. So, what if the universe is a communication? If it is, we must learn to listen the right way. Perhaps there is a message we have missed, about the Creator.